So habe das wichtigste am Template angepasst...Generell hab ich das eqdkp_clean Template als Basis genommen und weiter daran rumgespielt. Design mit neuer Core ist noch nicht fertig Werd ich posten sobald wir umsteigen. Im cicking on the update button and it seems to run through, because files like the language files i've modified get overwriten. There is no error displayed, but still it wants to be updated. What do i need to do to update properly? Maybe its just displayed wrong an i need to restart a certain service? Found a little bug in the game.class.php file. In row 231 is a wrong directory "$strIconServerPathPrefix = $this->server_path.'games/'.$this->game. 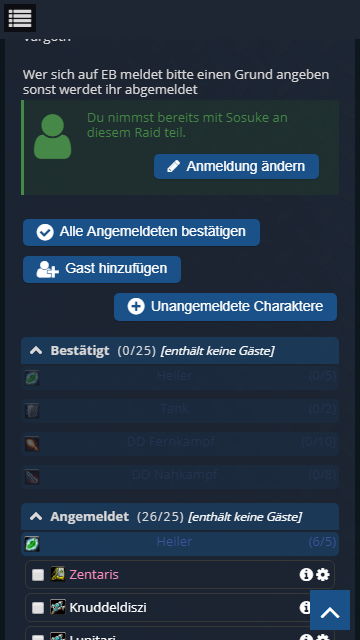 '/talents/races/'.$talent_id;" so the recruitment plugin couldnt load the talent icons. I changed it to: "$strIconServerPathPrefix = $this->server_path.'games/'.$this->game. '/icons/talents/'.$talent_id;"
I got it working thanks to this fix. From where does the script get the information about all speccs? For example i want to differentiate between Frost - mDD and Frost - Tank. im trying to display the corresponding speccs instead of the roles for each class. How can i change this? Is there a setting or do i need to change some code?